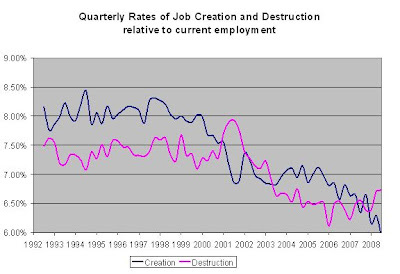 Economist's View: "Job Losses are Not the Problem"
"Job Losses are Not the Problem"
Why has the rate of both job creation and job destruction been falling in recent years? Job Losses Are Not the Problem, by Andy Harless: It is sometimes argued that recessions benefit the economy by allowing the destruction of old, inefficient economic structures so that newer, better ones can be created to replace them. On the surface, this story might seem to apply to the recent recession: ostensibly, a lot of useless jobs in finance, real estate, and construction were destroyed, as well as perhaps old manufacturing jobs that hadn’t caught up with the latest technology, and jobs in retail trade that needed to be replaced by the Internet, and so on. But there’s one problem with that point of view: overall (at least during the first four quarters of the recession, up through the end of 2008, for which we have the relevant data), there weren’t an unusually large number of total jobs being destroyed. I think both monetary and fiscal policy can help with restructuring, as noted above monetary policy can increase the return on projects and thus creates an incentive to find "new, productive uses of resources." Fiscal policy can, both literally and figuratively, pave the way for those projects to come to fruition. But, though fiscal policy in particular could have been devoted more toward helping labor and other resources make the transitions to new industries, and perhaps more could have been done to help with the creation of new opportunities, the main point I want to make is that we should distinguish between cyclical and structural unemployment. Much of the unemployment we are seeing is due to the business cycle, it has little to do with the need to restructure the economy, and both monetary and fiscal policy can be of great help with this problem. I don't know for sure how much of the change we are seeing is structural and how much is cyclical, but I am willing to assert that most of the change in unemployment is a cyclical rather than a structural phenomena. Thus, "even if I were to concede that monetary and fiscal policies don’t help speed up the adjustment process," though I see no reason to concede this, it only speaks to the ability of these policies to help with structural adjustment, monetary and fiscal policy are still very much needed to deal with the unemployment related to the business cycle.